a. 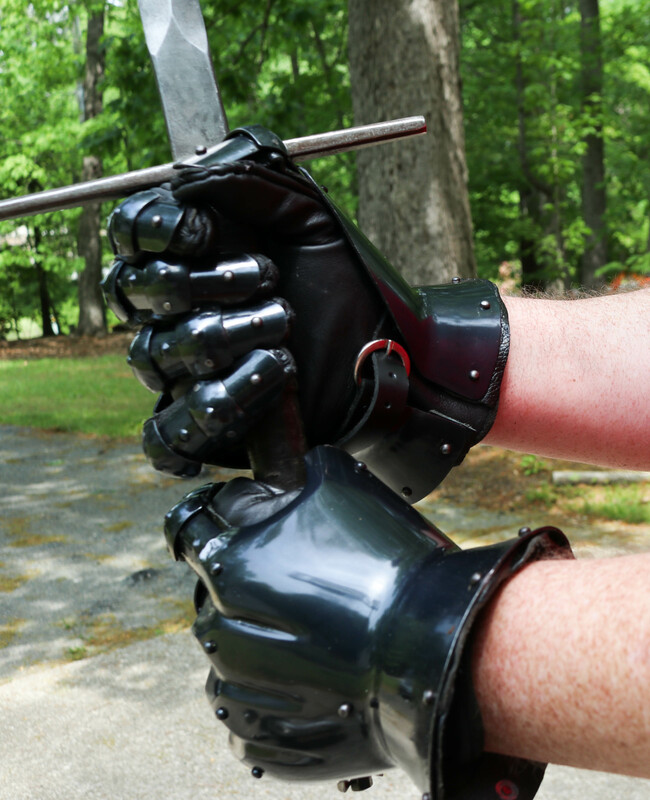 Areas of the backs of gloved hands, fingers and thumbs, to one inch above the wrist of both arms not protected by a hilt, parrying device, or rigid armor must, at a minimum, be protected by an additional layer of 1/4" open cell foam or equivalent resilient padding. b. If any combatant is using a two-handed weapon, all combatants in the bout must have rigid protection for areas listed in 2.D.v.a. 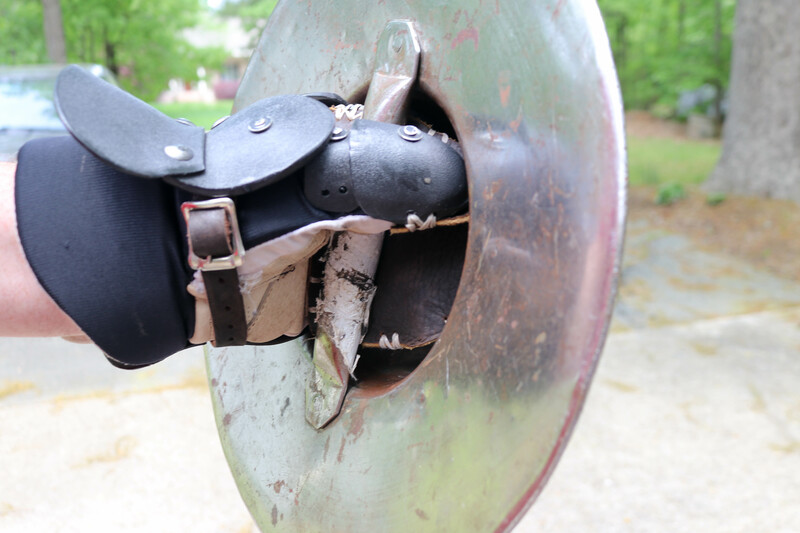 i. Gauntlets or demi-gauntlets made of rigid material covering areas not protected by the weapon's guard. 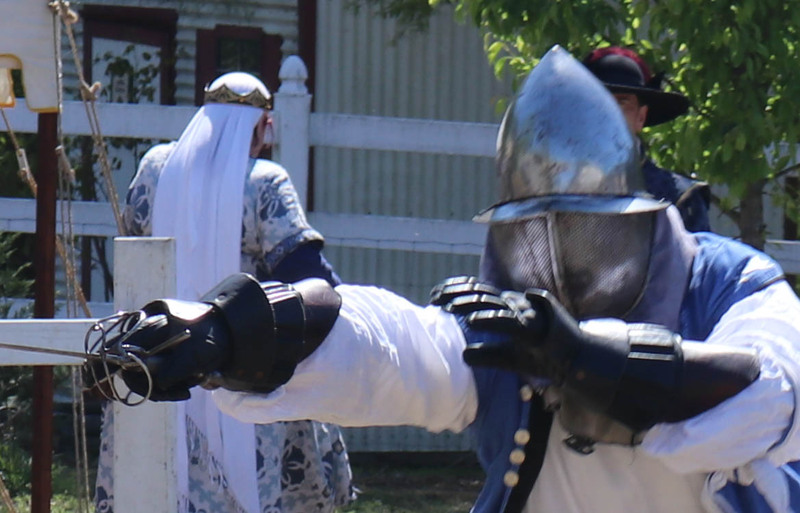 Master Brian de Moray, Atlantia's Kingdom Rapier Marshal, provided his guidance on implementing these rules in a post at https://marshal.atlantia.sca.org/rapier/rules-update-2018/. As a very early Atlantian C&T practitioner, I have a lot of C&T related gear that I have a accumulated. I wanted to go through it all and try to evaluate what I think will meet the new rules and what will not. Important note: You must meet the higher rigid protection requirement if either you OR your opponent are using a two-handed weapon. This may seem counter-intuitive but it is the intended result. I have skateboarding elbows on under my shirt since the stainless set in the first picture needs to have the elbow pads replaced due to worn out elastic. This combination may actually meet the new rules, but that determination will require a little more evaluation. My son shot a lot of pictures of me wearing my gear. Some are below. All of the pictures are available in this google photos album if you want to see more angles. 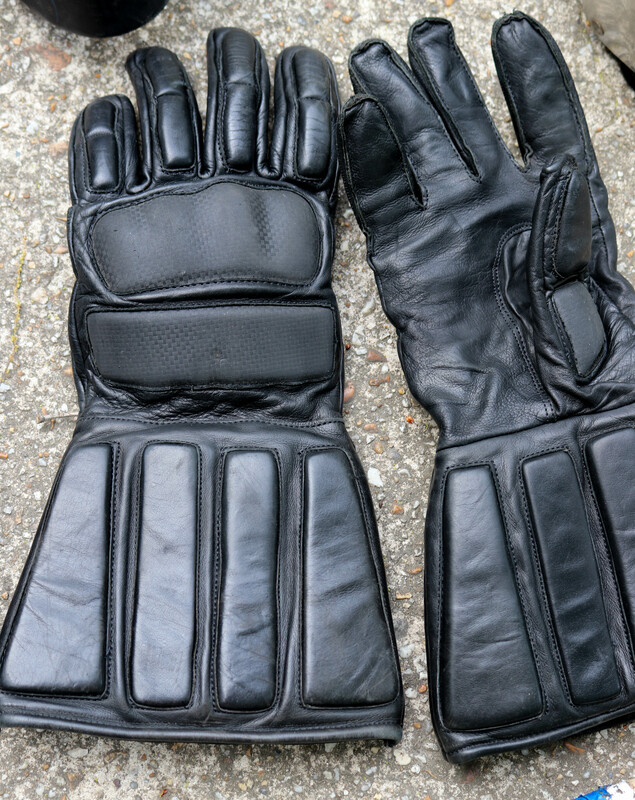 It's clear to me that unpadded leather gloves do not meet either the padded or rigid versions of the required protection unless one has a fully enveloping guard of some kind. However, padding can be added to meet the standard. There are a lot of similar padded/Kevlar insert gloves out there. I collectively call them "HMA Gauntlets". My pair came from Revival in 2013. The built up sections seem to easily meet the padding requirements and arguably may meet the rigid requirements. But, there is the problem of the un-built-up sections. I chose to wear my demi-gauntlets to protect the unpadded wrist area. These seem to meet the spirit but not, perhaps, the letter of the new rules. During a discussion on Facebook, the Society Rapier Marshal clarified that, to her, these seem sufficient and the leather only sections are ok. If all those raised areas were just padding, all of the above gloves look like they would indeed meet the requirement where padding is necessary (i.e. C&T that doesn't involve a two-handed weapon) and if they have rigid plates over the padding, then they would meet the requirements for two-handed weapons as well. As was aptly pointed out above, the requirement is to create reasonable coverage against a percussive cut. While it is possible that a weapon can strike perfectly between the padded sections of those gloves, they are designed specifically for this type of protection, so even that one-in-high-number chance blow will meet some resistance with the seams and material of these gloves. 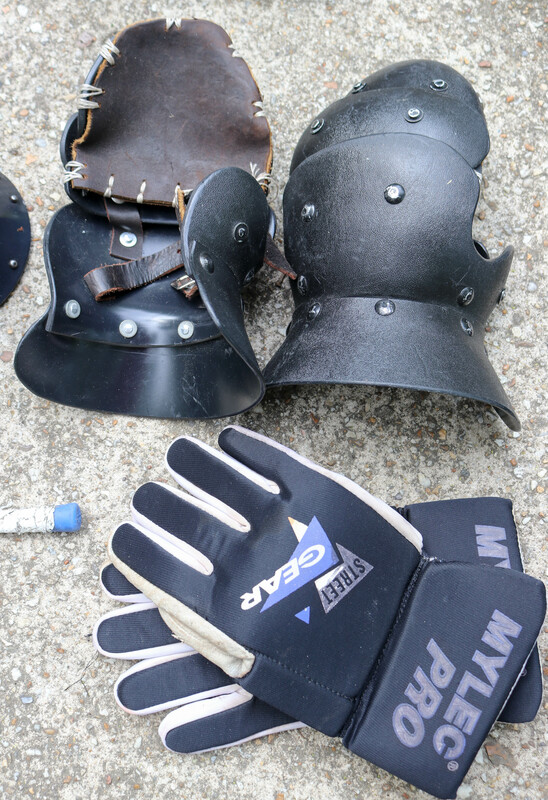 My regular set up adds demi-gauntlets (and vambraces) that I had from my time as an armored fighter. 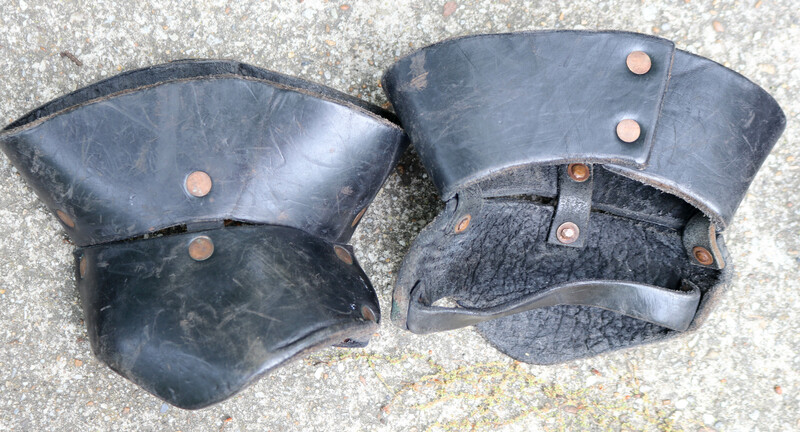 They're hardened (boiled, I think) leather and very rigid. 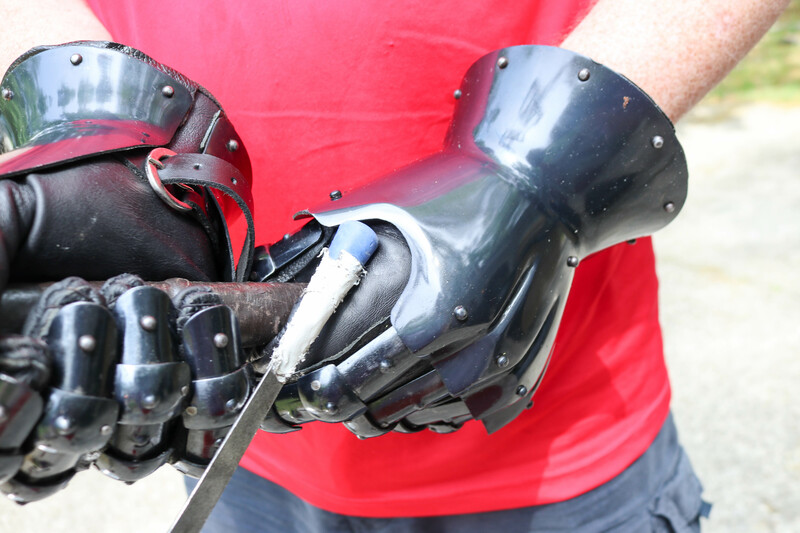 These cover most of the non-built-up areas on the HMA gauntlets and, I think, meet both the padded and rigid requirements with both the swept hilt and dagger guards shown. When used with my two-handed sword, I am a little less comfortable. I have used this configuration for my hands quite a bit against opponents that I am comfortable with. I have not been injured. 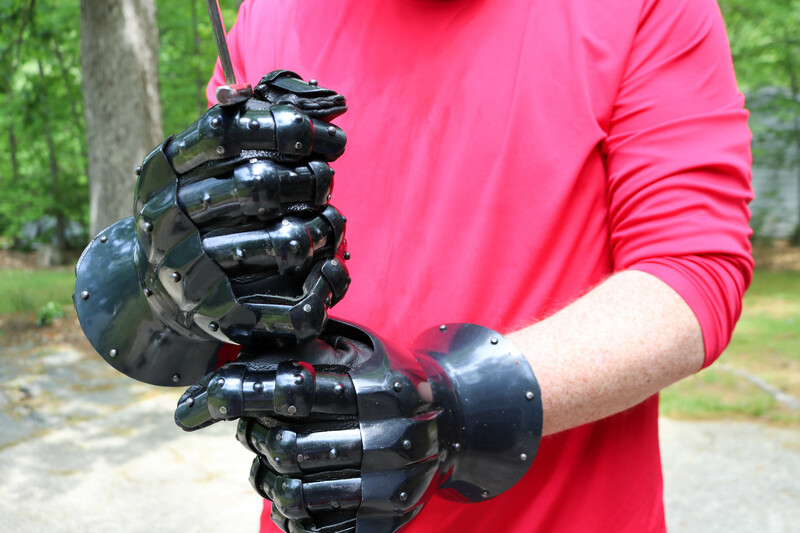 But, I have been concerned about my finger protection and have been planning to get rigid finger gauntlets for use with two-handed swords. 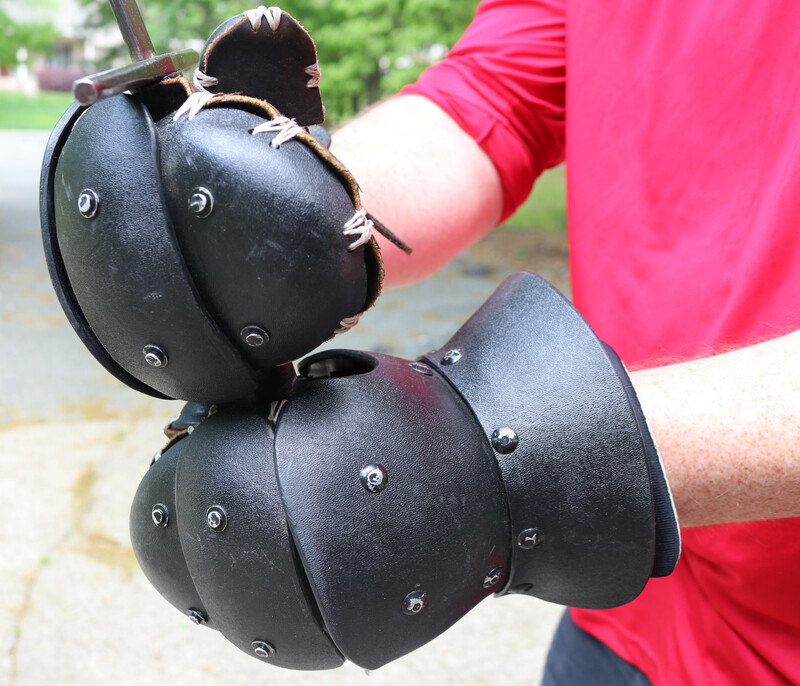 I purchased these gauntlets for armored spear use. They are designed to either have gloves sewn directly to the plastic edges or have thick leather plates sewn across the fingers and thumb. 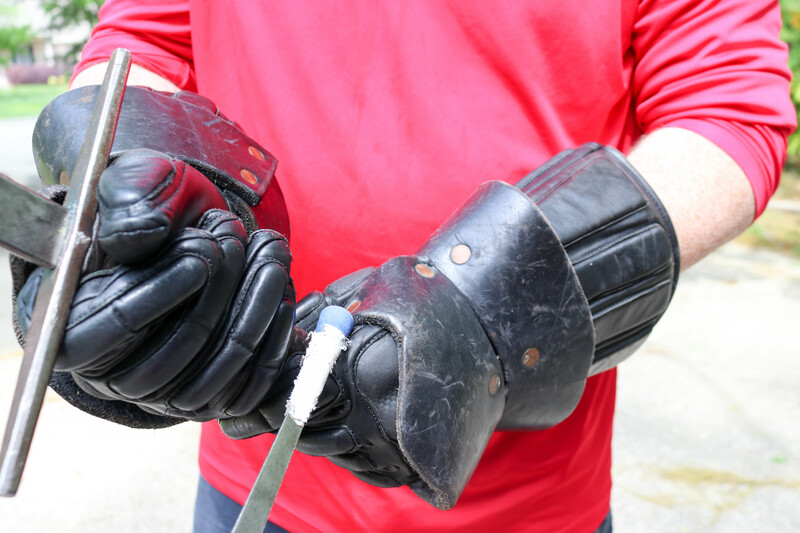 I use street hockey gloves to pad my hands a little against the rigid plastic. These meet all of the padded or rigid rules. They don't fit into either my swept rapier or my reaver dagger guards but can be used with my buckler and two-handed sword. 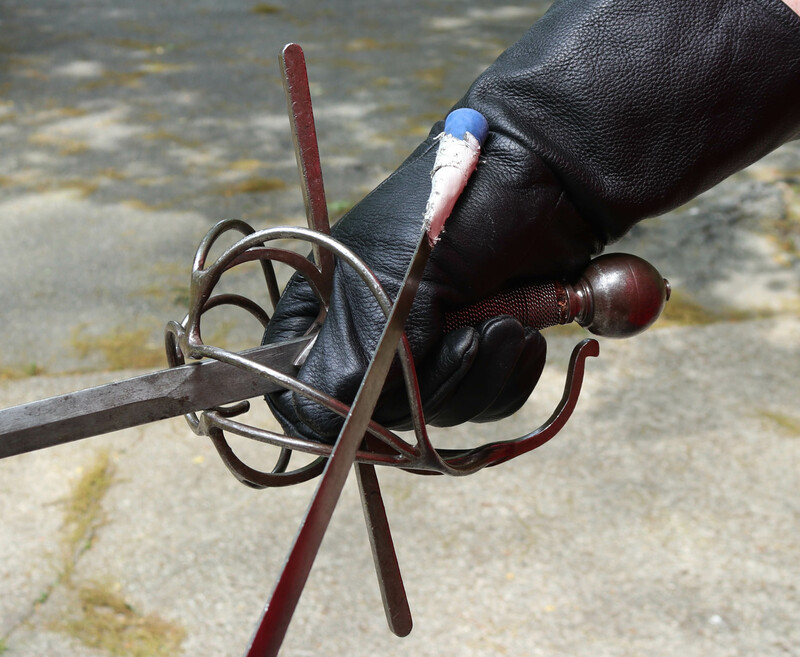 I have fought with them using my two-handed but I don't really like them as I have very little control of the sword since I cannot move my fingers separately. 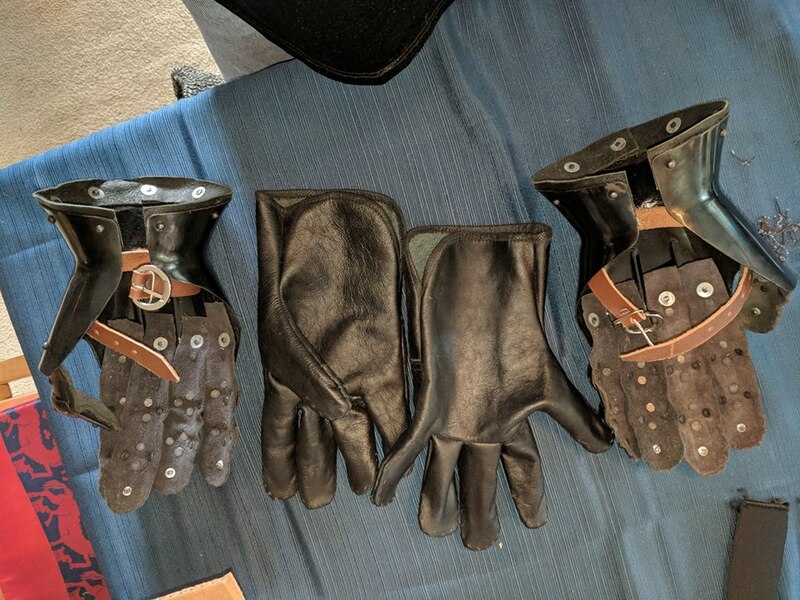 During the discussion of the new rules, someone linked to these finger gauntlets that were $55 a pair! They looked good and the price was amazing, so I decided to be a guinea pig for the Kingdom and give them a try. The company appears to be in India, but the package shipped from New York and took about a week to arrive. Shipping was almost $30. 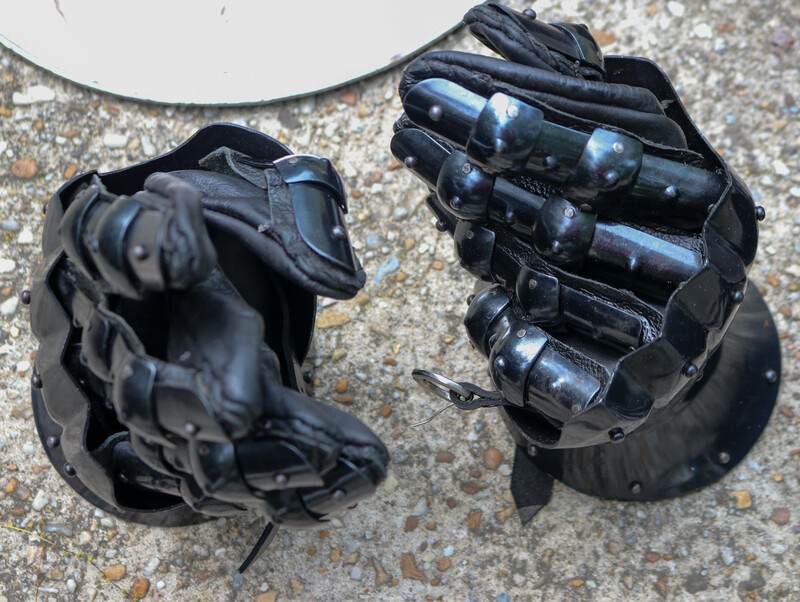 The company describes them as "Made from 16 Gauge Blackened steel covering hand and wrist area, the fingers are made from 18 gauge steel a fully functional Steel gauntlet." Each gauntlet weighs just under 2 pounds (1 lb 14.5 oz) according to my postal scale. 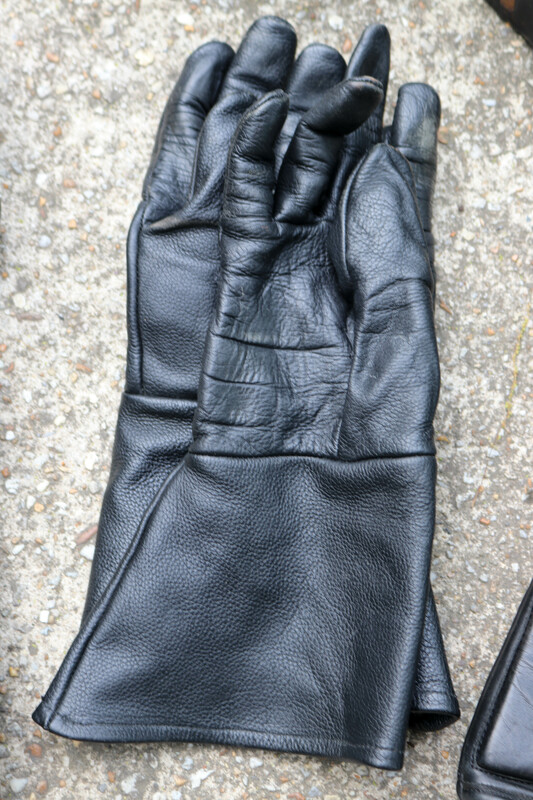 I have large but not huge hands (the unpadded leather gloves I wear are XL from Darkwood). These fit me almost perfectly. The narrow point on the right wrist is a little tight for me to get my right hand through, but I can do it. Once on, they feel great and I feel like I have lots of protection and control of my weapon. 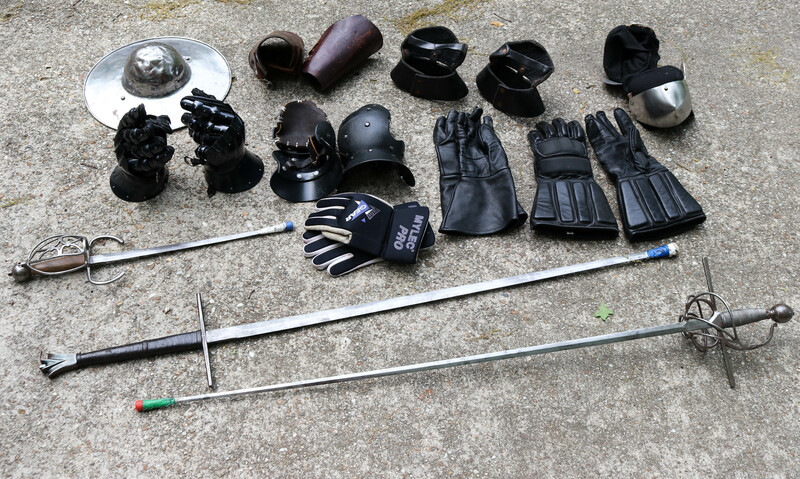 I can fit these into my swept rapier and buckler but not my dagger. I have some concerns about an exposed area between the thumb and index finger and on the sides of the fingers. The glove included with the gauntlets is unpadded. How exposed those areas are really depends on how the sword and other hand is positioned. 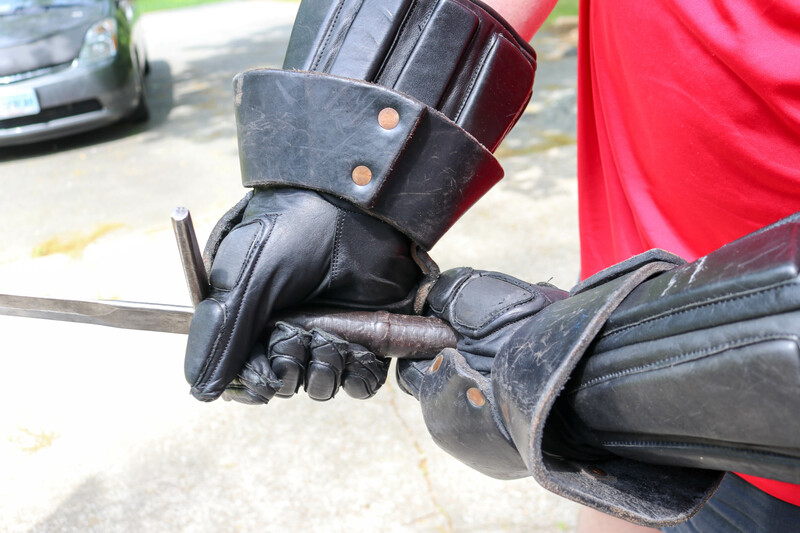 I am currently briefly sidelined due to some minor surgery, but I took the gauntlets to practice and had Master Charimmos hit them while I was wearing them as in the above picture. He used both a rapier and a katana and hit with a variety of energy levels. They worked great and only show the smallest of scratches in the finish on a couple of the knuckles. I also had a minor stinger on the upper knuckle of my middle finger from metal on bone. So far, so good. More pictures are available in this google photos album if you want to see more angles. Baron Aiden also purchased a set of these and had some ideas on how to improve them. Basically, we wanted to add padding between the metal on the fingers and the gloves, replace the gloves, and stitch the new gloves in further along the fingers than the originals were. For padding, we chose to cut up a simple neoprene mouse pad. We bought this large mouse pad on Amazon for $10 so that we had lots of material to work with. 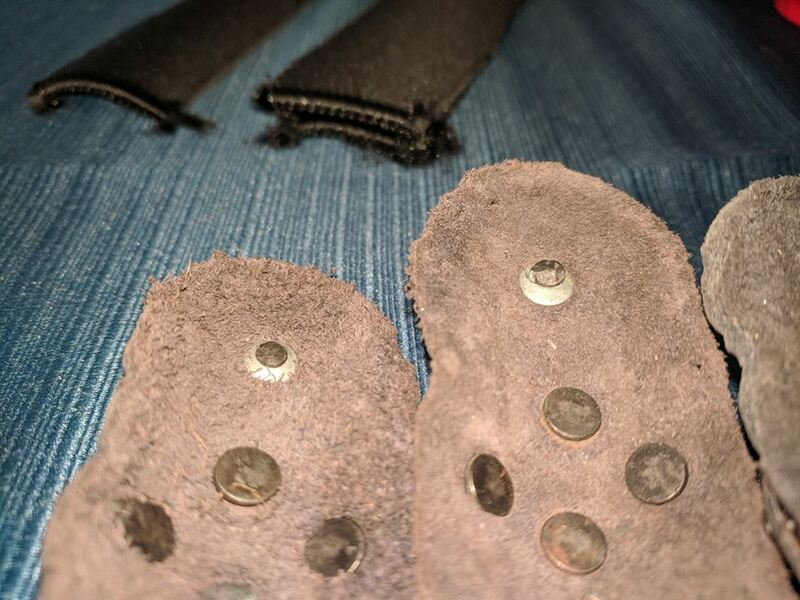 Once the gloves were removed, Aiden spotted some rivets near the finger tips that hadn't been peened over enough and could cause pain if driven into a finger. We fixed that. 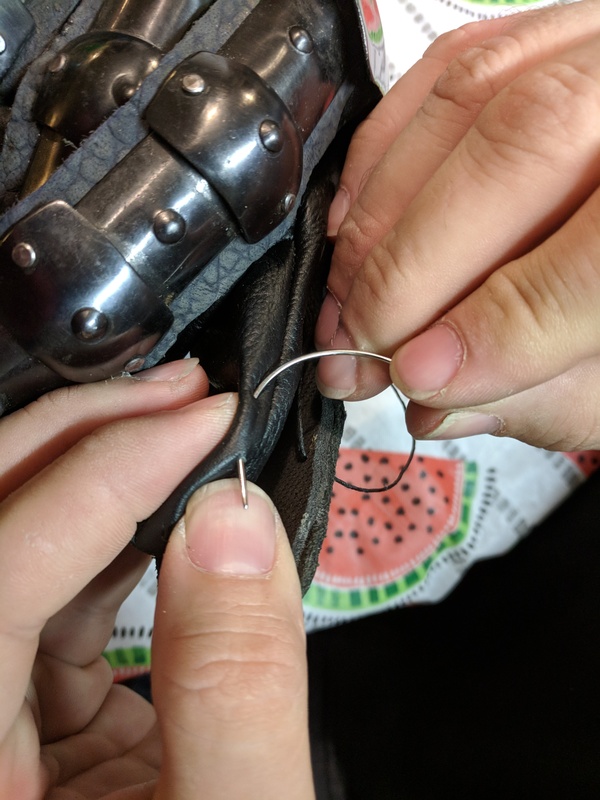 We did end up damaging and replacing one of the rivets during this process, so you may want to have spare rivets at hand before doing this stage. The next step was to cut padding from the mouse pad. We cut separate pieces for each finger and thumb and used one layer. 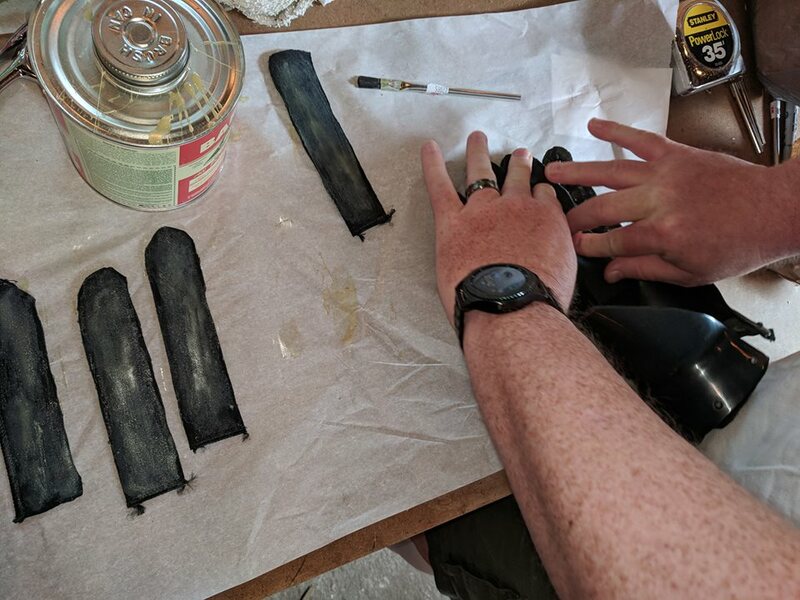 We attached the mouse pad to the leather that the gauntlets' metal pieces were riveted to using Barge cement. Important: Apply Barge cement only in extremely well ventilated spaces. Apply a coat to each surface and allow it to dry slightly. Both surfaces absorbed nearly all of the first coat so we applied a second coat. After it had become very tacky, we carefully applied the padding to the inside of the fingers. Allow at least 24 hours for the cement to set (more if you intend to do the next, sewing, step inside.) Here are the gauntlets with the new padding completely attached. 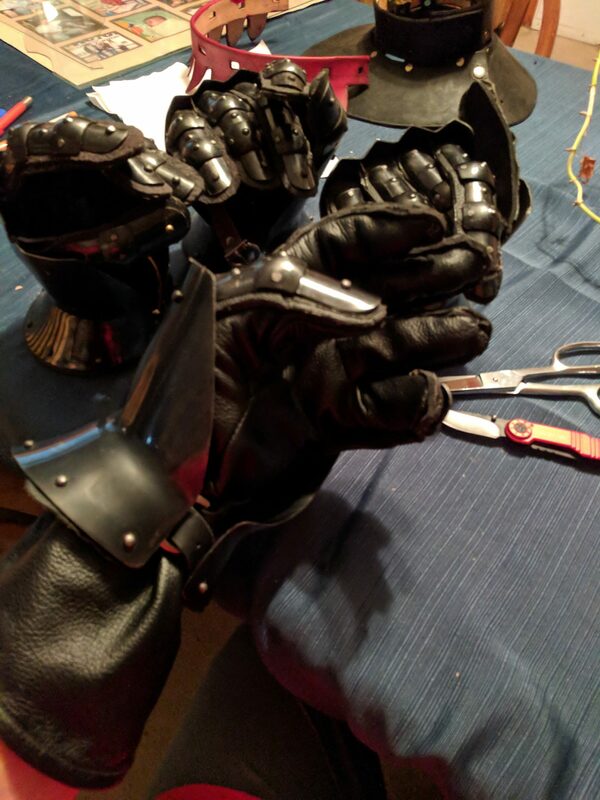 Some trimming will be done, then new gloves will be sewn to the fingers. 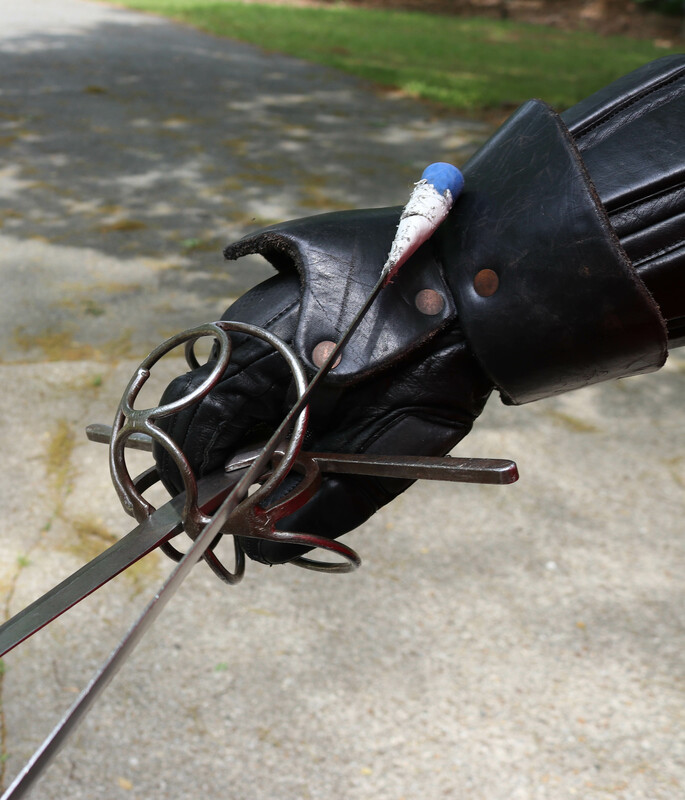 The new gloves we chose were Darkwood Armory's Fighting Weight Leather Gloves. We found that with the padding, sewing the gloves to just half of the first knuckle on the gauntlet worked best. Any more than that made it difficult to push the fingers into the glove. We used a saddle stitch for extra strength of the joint. 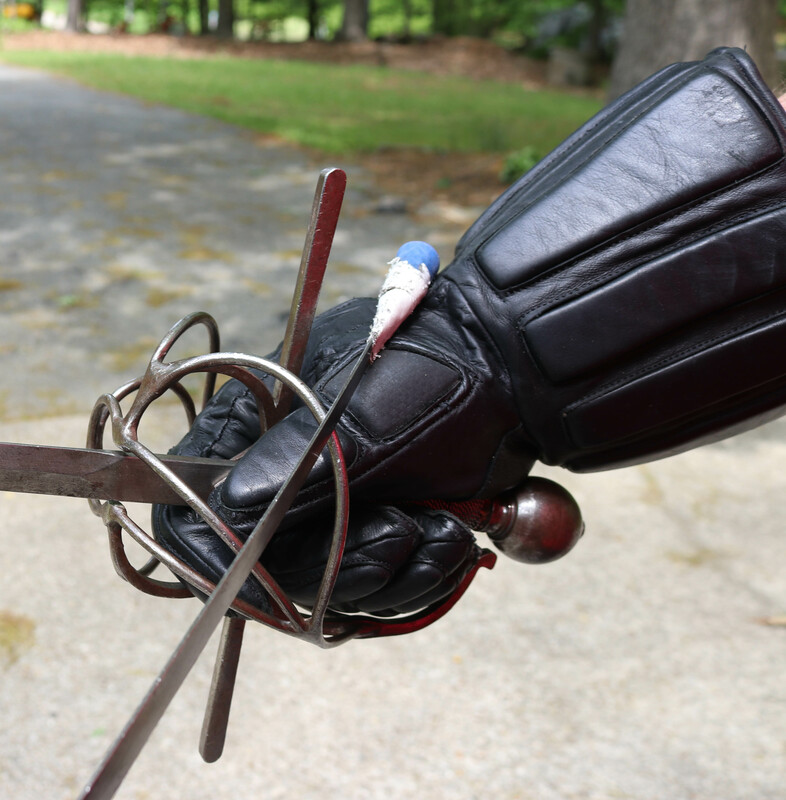 I have now practiced twice with the gauntlets and my two-handed sword. I love the mobility and protection but am still getting used to the weight. My upper arms and shoulders get tired fairly quickly. I guess there's just nothing to be done other than practicing more! The metal parts of the gauntlet are starting to show a hint of rust in a few spots. We intend to apply some artistic painting and then a clear coat of some sort. 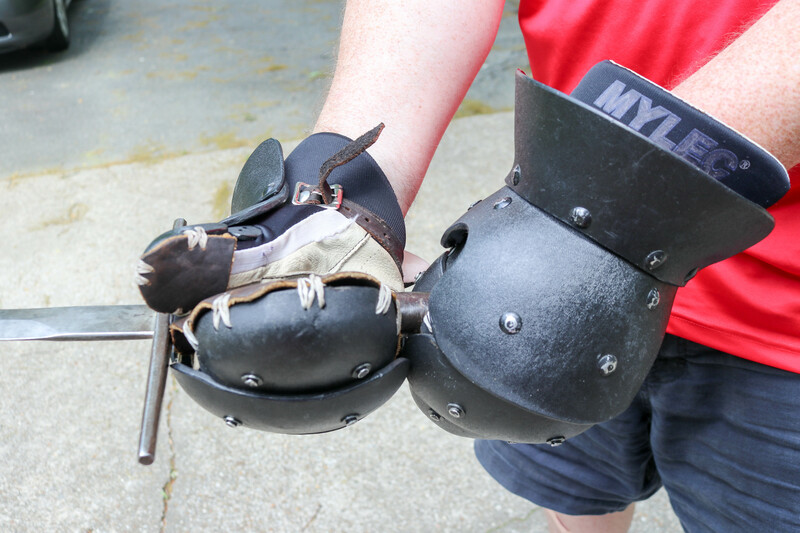 Update: I have worn these for several full speed practices and the C&T Longsword tournament at Pennsic 47. They did great and I'm very happy with them for the price and effort. 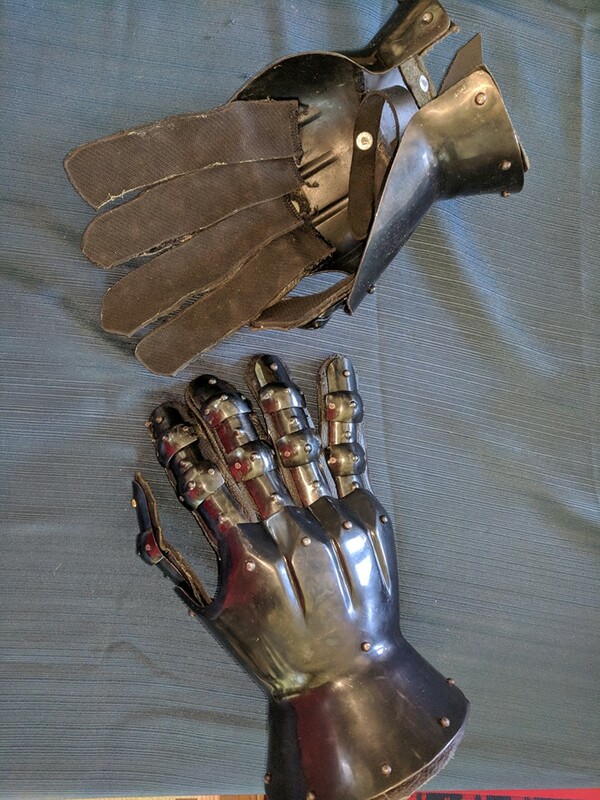 But they're heavy (HRM Dietrich's titanium finger gauntlets are amazingly light but probably two orders of magnitude more expensive) and I need help to get completely strapped into them and then to remove them. So, I wore them for the full tournament.